The passing of another season brings us an all-new remix album from Desert Dwellers co-founder Amani Friend and his downtempo music venture, Liquid Bloom. A sonic endeavor spurred by decades of travel and immersion in the world of ceremonial sound and organic instrumentation, Liquid Bloom has blossomed into a multifaceted collaboration project in recent years involving traditional musicians and high-tech electronic producers from across the globe. It has been glimpsed live in such settings as Lightning in a Bottle and Oregon Eclipse Gathering with appearances by many of Amani’s co-artists—most notably world music instrumentalist Poranguí—while also continuing to grow as a studio-based production from Amani’s home in Colorado. This equinoctial spring release comes from deep tribal house producer Mose on the heels of two remix albums of Liquid Bloom’s 2017 album Re:Generations—the first by deep bass producer AtYyA and the second featuring a tailored list of psychedelic electronica pioneers including Hedflux, Kaminanda, Tribone and more. Differentiating itself from the rest of the Liquid Bloom discography with its consistent use of four-to-the-floor beats, ReGen: Mose Remixes brings a trance-inducing edge to the deep spaces offered by the source material. Experimentation with slower tempos touches on the “slow house” phenomenon that is currently permeating the ecstatic dance scene, offering accessibility to a large cross-section of audiences without compromising the depth and medicinal intention behind each original track. Even the most energetic song, “Ecstatic Grounding,” clocks in at just 112bpm—well below traditional deep house tempos. However, unlike most deep house, this visionary approach to 4-4 music is infused with layers of crisp acoustic instrumentation, surrealistic rattles and drumming, ethereal vocals and holographic nature samples. Combined, this create a spacious, living environment in which movement is free and energy levels rise and fall smoothly without need for the formulaic build-up-and-drop arrangement so prevalent in modern dance music. Mose’s production gives the body something to move to while the mind traverses the vivid landscapes of emotion and sensation emanating from Liquid Bloom’s exploratory and naturalistic sounds. 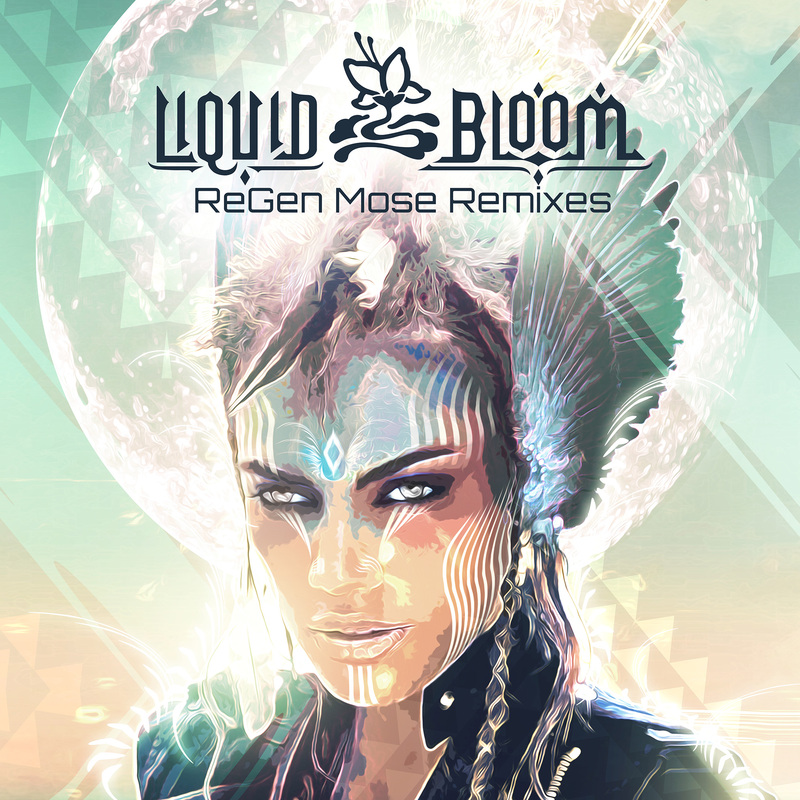 Rhythmic and danceable yet mystic and meditational, it is these rich sceneries of sound that distinguish the Liquid Bloom project and the many incarnations it has taken through each remix from much of the other downtempo and world music being created today. Designed for the seekers and seers that often lie dormant within even the most attuned of listeners, these tracks are capable of transporting one from the complex worlds of daily life into an open realm where thoughts, feelings, emotions and dreams coalesce without boundary. Following in the footsteps of each Liquid Bloom release over the last year, ReGen: Mose Remixes adds another brilliant dimension to Amani’s medicinal twist on traditional downtempo. With Mose’s distinct tribal sound bringing footing and approachability to the expansive collection of styles represented in the ReGenerations discography, one can only wonder what is next for this mesmerizing project in the seasons that lie ahead.